Summary: Current CO2 (carbon dioxide) + CH4 (methane) radiative effects of 433 ppm (parts per million) CO2-equivalent (including the effects of CH4) are dangerously close to the 450 ppm CO2 level at which the polar ice sheets formed 34 Ma (Ma = 1 million years-ago) (Hansen et al., 2008), consistent with the fast ice melt rates of the Arctic Sea, Greenland and west Antarctica. 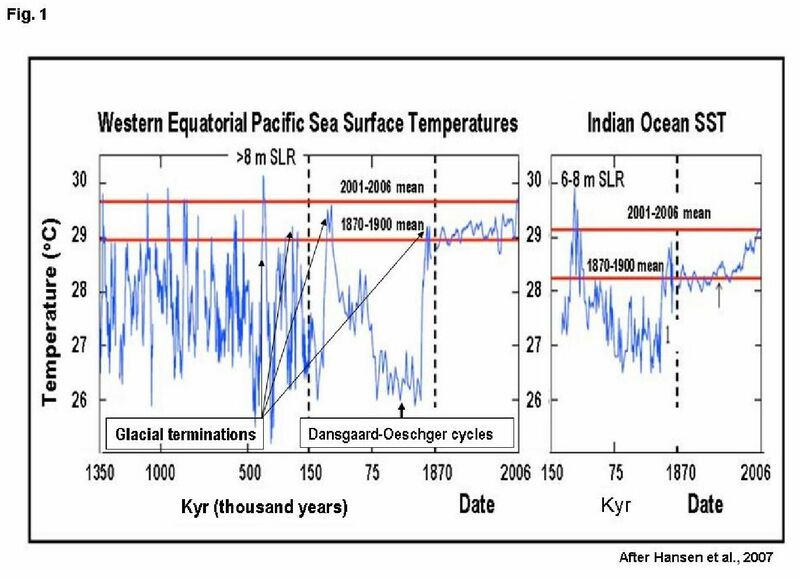 Ice core studies of the Pleistocene (1.8 Ma to 11.7 kyr) (kyr = one thousand years-ago) glacial-interglacial cycles display abrupt global warming and cooling events on time scales of few years to decades (Steffensen et al., 2008; Kobashi et al., 2008). 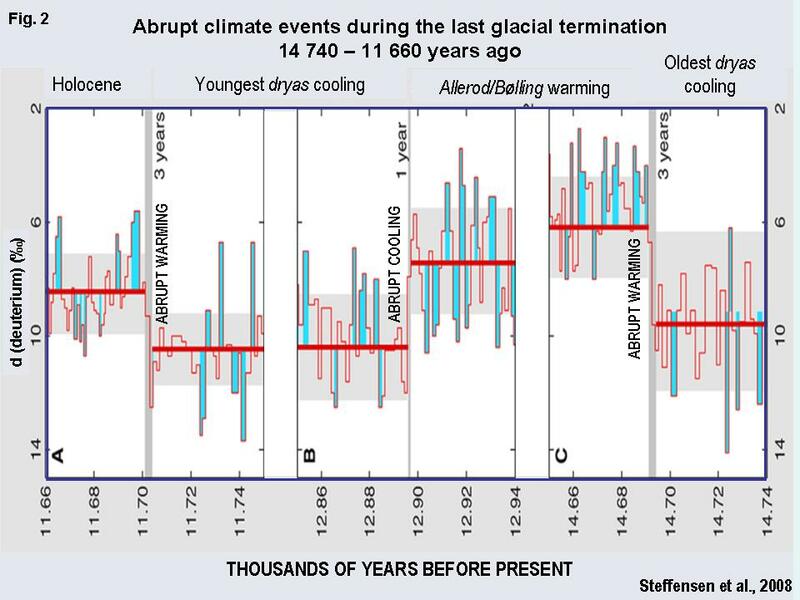 This includes sharp climate tipping points at 14 700, 12 900 and 11 700 years-ago (Kobashi et al., 2008) and intra-glacial cycles between 80 000 and 20 000 years-ago (Broecker, 2000; Braun et al., 2005). The Polar ice sheets react sensitively to solar orbital forcing (a function of the Earth’s position and axis tilt relative to the sun) through feedback loops which include ice albedo loss, absorption of infrared radiation by exposed water and water-ice interaction. Greenhouse gases (CO2, CH4) released from warming seas and drying biosphere increase atmospheric radiative forcing, decreasing the oceans CO2 absorption capacity. 20th century solar irradiation increase accounts for ~0.12 Watt/m2 (*) (IPCC-2007) (IPCC: Intergovernmental panel for Climate Change) whereas the emission of over 305 Gigatons (billion tons) of carbon and land clearing accounts for ~1.6 Watt/m2. Plans for climate “stabilization” at 450 ppm CO2-e may lead the Earth to conditions preceding the formation of the polar ice sheets, whereas plans for “stabilization” at 650 ppm may track toward conditions at the 55 Ma greenhouse event and associated extinction. IPCC climate projections and government plans for emission caps restricting temperature rises to ~2oC or ~3oC degrees take little account of the non-linear nature of ice-ocean-atmosphere-biosphere feedback effects. The evidence of climate past is like the Ghost of Christmas Past in the Dicken’s tale, warning the recalcitrant Scrooge not to ignore old lessons. Glacial-interglacial cycles documented in sediments and ice cores up to 640 000 years-old (640 kyr) were initiated by near-instantaneous global warming and cooling events on the scale of few decades to a few years (Figures 1 – 3), implying an extreme instability of the Earth’s atmosphere. This evidence, including repeated events where mean global temperature rose by several degrees Celsius over time scales of a few years to a century (Steffensen et al., 2008; Kobashi et al., 2008), testifies to a high susceptibility of the atmosphere to minor to moderate energy forcings. (forcing = change in energy input). Figure 2. Deuterium-drived determinations of temperatures from Greenland NGRIP ice core for the period 14 740 – 11 660 years-ago, displaying abrupt warming and cooling changes between the ‘oldest dryas’ cold period, Allerod and Bolling warm periods, youngest Dryas cold period and the Holocene. Note transitions occur over periods of 1 – 3 years (Steffensen et al., 2008). Glacial terminations (abrupt end of glacial periods) at intervals of about 100 kyr, 41 kyr and 23 kyr (Milankovich cycles: periodic changes in the precession, obliquity and eccentricity of the Earth relative to the sun) were triggered by axial tilt toward the poles, exposing the ice sheets to higher angle radiation, elevating mid-June insolation by up to <60 Watt/m2 at latitude 65oN. The glacial terminations, triggered by solar pulsations in the order of ~0.25 Watt/m2 (Hansen et al., 2007), developed into mean global solar radiation anomalies of 4 to 5 Watt/m2, triggering ice melt feedback loops and greenhouse gas release loops. Evidence for the last glacial termination based on deuterium (heavy isotope of hydrogen) and oxygen isotopes (the ratio of 18O/16O which correlates with temperature) from the Greenland NGRIP ice core indicates sharp 3-years-long warming by 2 to 4oC at 14.7 kyr, sharp 1 year-long cooling at 12.9 kyr, and sharp 3 years-long warming at 11.7 kyr (Steffensen et al., 2008) (Figure 2). Evidence for the last glacial termination from the Greenland GISP-2 ice core, based on Nitrogen and Argon isotopes, indicates abrupt warming by 10±4oC at 12.8 kyr over a period of ~100 years and abrupt warming by 4±1.5 oC at 11.27 kyr over period of 70 years (Kobashi et al., 2008). Sea level rose by 40 metres following the termination up to about 8500 years-ago (Siddall et al., 2003). Mean global temperature changes are estimated as about half the polar temperatures, enhanced by albedo loss. Extreme climate change events in the recent history of Earth include Intra-glacial warming cycles, termed Dansgaard-Oeschger (D-O cycles), between 80 kyr and 20 kyr, including twenty one (21) ~1470 years-long cycles, each initiated over decades-scale time frames. The D-O cycles are attributed to interactions between weak solar radiation maxima and ocean current systems (Braun et al., 2005). Figure 3. 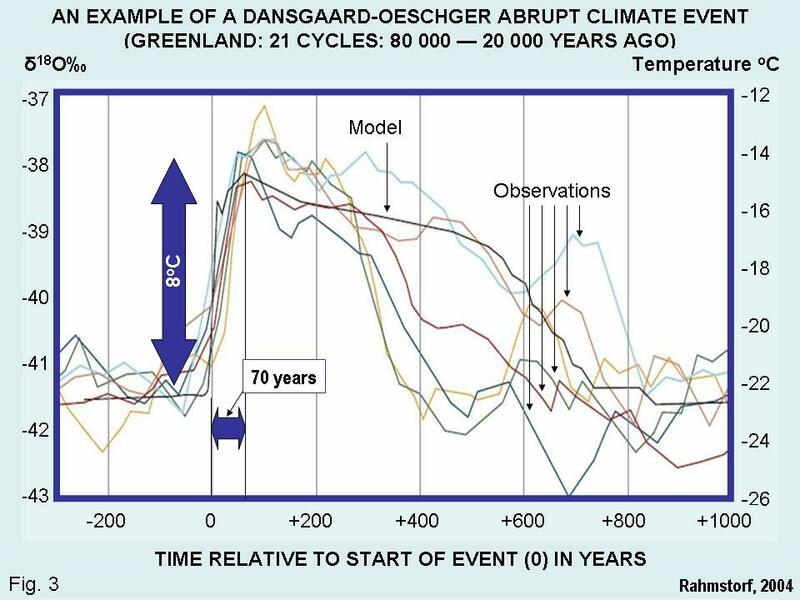 An example of a Dansgaard-Oeschger abrupt climate event. 1 of 21 cycles during the alst ice age, 80 000 – 20 000 years-ago. Greenland ice core (Rahmstorf, 2004). The fast rise of the greenhouse gas forcing component since the mid-1800s, at levels since 1960 reaching 387 ppm in 2007 at rates of >2.14 ppm/year (as measured at Mauna Loa, Hawaii), are two order of magnitude higher than CO2 rise rates of 0.012 ppm/year at the last glacial termination. 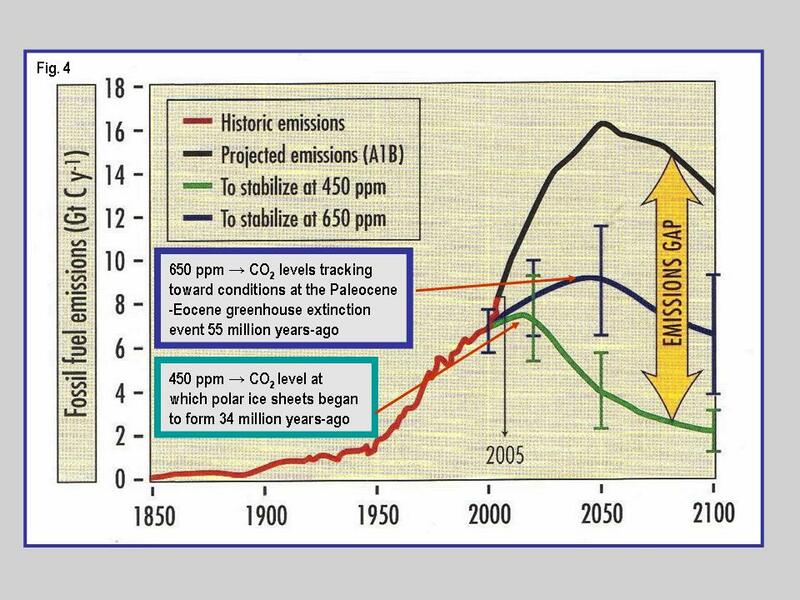 Where 1 ppm CO2 induces an atmospheric energy rise of ~0.02 Watt/m2, this equates to an increase of 1.7 Watt/m2 in atmospheric radiative energy since 1750, not counting carbon cycle and ice melt feedbacks. The combined radiative synergy of ice melt-feedback and greenhouse gases-feedback triggering rapid polar meltdown affected pole-ward migration of the inter-tropical convergence zone (ITCZ), subtropical arid zones and mid-latitude zones, affecting the ocean thermohaline circulation. The Greenland ice-melt flow results in abortion of the Gulf Stream which warms Europe and northeast America. Warming of the southern oceans weakens the Humboldt current west of South America and the trade winds, indirectly enhancing the ENSO El-Nino events (ENSO: El-Nino Southern Oscillation) which result in droughts in the southwestern Pacific, India and Africa (Trenberth et al., 2002). The non-linear nature of atmospheric CO2 and CH4 rise, from 1.3%/year in 1990-1999 to 3.3%/year in 2000-2006, combined with further ice melt and albedo (reflectivity) decline and carbon cycle feedback effects, including release of CH4 hydrates, drying/burning biosphere, reduced CO2 sequestration by the oceans, threatens to move the Earth’s atmosphere into and enhanced glacial termination-like conditions. Rapid ice melt rates in Greenland, the Arctic Sea and west Antarctica, the latter continuing through the southern winter, are documented from satellites and on the ground. Comparisons between abrupt glacial-interglacial terminations and 21st century projections are complicated by the lower mean global temperatures at which the glacial terminations commenced and the large volumes of ice compared to the Holocene (11.7 kyr to the present), including the Laurentide (North American) and Fennoscandian (Eurasian) ice sheets. However, that the solar pulse from orbital variations which triggered the glacial terminations is estimated as up to 0.25 Watt/m2 (Hansen et al., 2008) does not bode well for current global warming, triggered by ~1.6 Watt/m2 anthropogenic increase in atmospheric radiative energy (IPCC-2007). Mean global atmospheric energy rise associated with the glacial terminations of +4 to +5 Watt/m2 (~ +5 to +7oC) are in the upper range of the IPCC projections for the 21st century, +1.1 to +6.4oC. Time tables for carbon emission reduction targets, such as 20 percent by 2020, or 60 percent by 2050, take little account of the rates of ice sheet melt/water feedbacks loops and carbon cycle feedback loops, including release of methane hydrates from sea bottom sediments and from bogs. For continuing CO2 rise rates at 2.14 ppm/year, atmospheric levels by 2020 will be 412 ppm and by 2060, 477 ppm, i.e. CO2-equivalent (CO2 + CH4) values will be well in excess of polar ice sheet thresholds. Figure 4. Projections of CO2 stabilization scenarios as a function of emission caps through the 21st century (after M. Raupach, CSIRO). Added annotation by AG indicate CO2 levels at which the polar ice sheets formed in the late Eocene (34 Ma) and at which the Paleocene-Eocene Thermal Maximum event (PETM) occurred at 55 Ma (Zachos et al., 2008). It is at a time after the ice sheets formed that coincided with a time in Earth history when mammals emerged from their burrows and dominated the large-bodied fauna, whereas they had survived during the super-greenhouse pre-65 Ma age of the dinosaurs at the periphery [Ed: As my hyperlinks indicate, it’s likely to be a little more complex than this]. On an ice-free Earth, toward which climate is tracking in the 21st century, it could be the birds — the descendants of the dinosaurs — which may be able to escape the fastest from extreme weather events. 2) We know Earth isn’t Venus. All this is a reminder that when people posit negative-feedback mechanisms (like Lindzen IRIS) that make the problem go away, the historical record’s strong jiggles don’t offer confidence. Haven’t had time to read and digest the above, but this new paper looks relevant. about who is reading this blog? We know who is contributing comments, but who is reading? When I first started reading about about global warming, my first response to ice core temperatures was “You can tell the temperature 200,000 years ago by looking at a piece of ice? Pull the other one!”. People I talk to about climate change often say something similar: “How long have people been measuring temperatures? 100 years maybe? … “. You can imagine the rest. For anyone reading who has precisely these questions, then Richard Alley’s “Two Mile Time Machine” is a great read and explains qualitatively what is going on. Also quite brilliant is Mark Bowen’s “Thin Ice”. Secondly, for those without a quantitative background. Read v e r y s l o w l y, stop after each sentence and have a think. You’ll find that things which look absolutely impenetrable at first glance, will be much easier if you adjust your reading style in this way. Expect to spend 5 to 10 minutes taking in each graph and don’t expect to understand at the same rate as people who have spent many years honing their skills. A lot of Siberian permafrost is under the ocean: for instance an area six times the size of Germany containing about 540 billion tons of carbon. That submarine permafrost is perilously close to thawing. Three to 12 kilometers from the coast the sea sediment is just below freezing. The permafrost has grown porous, there is a loss of rigor in the frozen sea floor, and the surrounding seawater is highly oversaturated with solute methane. There is a very inexpensive simple way to immediately cool the Earth: just put a small amount of aerosol into the air to dim the sun. On RealClimate, Gavin Schmidt once said that it would be easy to stop global cooling through geoengineering: just emit lots of halofluorocarbons (HFCs). They have high global warming potential and long atmospheric residence. This suggests to me that geoengineers ought to be looking for aerosols with long residence times. Surely you’re comparing, if not exactly apples and oranges, then cumquats and oranges here? You can’t validly draw conclusions from direct comparison of current CO2-e with ancient CO2. Unless you have evidence that there was precisely zero CH4 in the atmosphere at 34 Ma? BERNER R. A. 2004. The Phanerozoic Carbon Cycle: CO2 and O2. Oxford University Press, New York. BERNER R. A. 2006. GEOCARBSULF: a combined model for Phanerozoic atmospheric O2 and CO2. Geochimica et Cosmochimica Acta 70, 5653 – 5664. BERNER R. A. & BEERLING D. J. 2007. Volcanic degassing necessary to produce a CaCO3 undersaturated ocean at the Triassic – Jurassic boundary. Palaeogeography, Palaeoclimatology, Palaeoecology 244, 368 – 373. BERNER R. A., VANDENBROOK J. M. & WARD P. D. 2007. Oxygen and evolution. Science 316, 557 – 558. BEERLING D. J. & BERNER R. A. 2005. Feedbacks and the coevolution of plants and atmospheric CO2. Proceedings of the National Academy of Science 102, 1302 – 1305. Cosmochimica Acta 66, 3757 – 3767. ROYER D. L. 2006. CO2-forced climate thresholds during the Phanerozoic. Geochimica et Cosmochimica Acta 70, 5665 – 5675. ROYER D. L., BERNER R. A., MONTANEZ I. P., TABOR N. J. & BEERLING D. J. 2004. CO2 as a primary driver of Phanerozoic climate. GSA Today 14, 4 – 10. ROYER D. L., BERNER R. A. & PARK J. 2007. Climate sensitivity constrained by CO2 concentrations over the past 420 million years. Nature 446, 530 – 532. Andrew, I don’t think you’ve understood me correctly. I’m not querying the veracity of the 34 Ma CO2 concentration estimate, just that it’s incorrect and misleading to compare it directly to the current CO2-equivalent. Or are you saying that the CO2 proxies are actually measuring CO2-equivalent? The Hansen et al 2008 paper doesn’t seem to indicate such. As you are no aware CH4 oxidizes to CO2 in the atmosphere. For example the methane CO2-equivalent effect over a short ~20 years is high (~70 times CO2), and is reduced over a period (to lower than ~20 times CO2 over a century or so, depending at what climate zone and level of the atmosphere oxidation occurs). This is one reason the IPCC estimates, which hinge on century-scale projections, have been criticised. For periods as long as millions of years, CH4 effects translate to CO2 effects, measured by plant Stomata. Measurmenets methods and age dating are not accurate enough to be able to “capture” the CH4/CO2 ratios at any given short time scale. This example by AndrewG is hysteria-based and once again an example of “scientists” proclaiming something they know nothing about but then claiming it as proof of humans causing dramatic accelerations, of tipping points, chain reactions, of toppling of big dominos etc which is the language of alarmism. There is much expert evidence why this is not true. As you obviously have the knowledge that supercedes this, perhaps you could share with us the refutation of all such evidence. posted 4 September 2008 at 4:15 PM by Bernard J.
I am in receipt of your message of 4-9-08. 1. I prefer to have discussions on the pages of bravenewclimate. 3. In this regard, I draw your attention it is a basic scientific procedure to focus on the technical issues, rather than reflect on the authors. The latter approach does not add anything weight on one’s arguments. 5. In so far as you have an issue with mainstream climate science, the correct way of presenting your observations and arguments is through the peer review system. I therefore encourage you to develope and formulate your ideas with this purpose in mind. 6. To this effect I recommend you consult Dr Barrie Pittock’s (probably Australia’s most experienced and authoritative climate scientist”) report and first chapter of the new book “Turning Up The Heat” – which you can now download from the internet. Andrew, thanks for this, but you’d better email it to Tim also. He’ll not be darkening the virtual door of this blog again. The rapid onset of warming periods recorded in ice cores indicates the abrupt nature of the transition from glacial to interglacial regimes. This is consistent with the large positive feedback expected from albedo reduction due to deglaciation of lower latitudes. – the current Arctic ice cap occupies a much smaller area of the Earth (well over 50% less). On this ground alone, albedo-derived positive feedback from reduction of the current ice cap can be expected to have correspondingly much less impact on both the total planetary heat budget and global sea levels. – are less insolated (my back-of-envelope calculation indicates 25-30% less for summer insolation; the differential is greater for the rest of the year). Hence it can be expected that the amplitude of positive feedback from albedo reduction will be significantly less still. The conclusion: There are good reasons for thinking that warming superimposed on the current interglacial will not have the same catastrophic character as previous glacial-interglacial transitions. Of course I wish you were correct. 1. As you will see from global temperature change maps: http://www.giss.nasa.gov/research/news/20070208/ Warming of the polar regions is double that in lower latitudes, corresponding to ice albedo loss / ocean warming feedbacks. West Antarctica about +2 degrees C realtive to 1951-1980 base line). East Antarctica is less effected to date, although warming around the margins. 2. There was more ice at the outset of the last glacial termination (Laurentian and Fennoscandian ice sheets). It started at 4-5 degrees C lower than present. CO2 feedbacks went up from about 180 to 280 ppm, whereas now they are another 100 ppm higher at 387 ppm. 3. The Milankovich cycle terminations are attributed to minor initial orbital forcings (~0.25 Watt/m2 global energy rise at the outset of glacial terminations). The 19-20-21st Centuries forcing due to CO2+CH4 emissions is at least 6 times stronger — at 1.6 Watt/m2. http://www.zeroemissionnetwork.org/files/MILESTONES_19-6-07.pdf (I can send you the published paper on request geospec@iinet.net.au). 3. No one is drawing a PRECISE analogy between Milankovich glacial terminations and current climate change. We are talking about global warming events reflecting powerful SYNERGY of the atmosphere-ocean-biosphere system, triggered in more than one way, i.e. orbital, greenhouse, volcanic or impact-related. 4. The point is — all of these events betray an extreme sensitivity of the atmosphere-ocean-biosphere system to even minor energy nudges. WHICH simply confirms not a focus on the technical issues as such but in your own words your worship of these authors …. where i agree will certainly “not add anything (sic) weight on one’s arguments”. To which i see ONLY ever draws attention to anthropocentric issues…… i.e. our human built in bias and mode of conceptualisation. i.e. No matter how aesthetically pleasing something is, or how numerous or prestigious its supporters are, or how many billions of dollars a certain industry has bet on it….. it will always come down to ….. does the theory over-ride the evidence? Hysteria? Worship? In your case, Kieran, it’s a question of whether your devotion to such overblown rhetoric to the exclusion of any evidence has any value at all. I would say not. Barry, recall that Tim C. has been known to engage in sock-puppetry. Just sayin’. Could be Steve, but Keiran (if it is the same one) has been a regular protagonist on the Online Opinion forums, so I think he’s the real anon deal, rather than a Tim C sockpuppet like the infamous “Reality Check”. Steve, both Tim C and Keiran are science ‘wanabes’. I don’t think they are one and the same, the former distorts science while the latter doesn’t even understand it. Their musings expose them for what they are. I would not be surprised if agnostics towards AGW have been bemused by their rants. Barry, i am Keiran and there is only one of these nobodies as far as i know in the blogging world. Quite frankly i’m not expecting to effect any change in people other than to perhaps in some small way pose a few questions and express the LOVE to find out for oneself. Simply, as a nobody poster i may even need to work harder to establish credibility rather than relying on credentials if this was a matter of importance. In my case, identity isn’t because the argument/opinion should be able to stand on its own merit if it makes sense. Who you are or think you are is of little relevance when it comes to earth’s climate because our largest plasma discharge formation the sun and our galactic environment don’t go to the ballotbox and vote on anything because it doesn’t care. In this thread why do i only see this piddling anthropocentric mindset? Barry, I believe convection is the dominant way heat is exchanged. I also believe that the terminology ‘greenhouse effect’ and ‘greenhouse gases’ are misleading for what amounts to nothing more than the amount of heat stored in the air and water vapor column every day. Hope this helps and let’s hear from solar scientists who demonstrate a clear relationship between solar change and climate change. change during the twentieth century, we point out that solar variability is unlikely to have been the dominant cause of the strong warming during the past three decades3. Sami K Solanki presents the Harold Jeffreys Lecture on the links between our climate and the behaviour of the Sun, from the perspective of a solar physicist. What do you mean Keiran? Are you not the same Keiran who was saying not so long ago that Galactic Cosmic Rays were the reason for this latest warming trend? We’re still waiting for that evidence that I requested on 4 September 2008 at 16.15. I notice that Graeme Bird called me a liar on Marohasy’s blog in response to my observation on your comment (in the last line #12). Unfortunately for him, the scientific world knows better than he does, but I am nevertheless expecting you to validate your claim upon which you based a ‘penance’ for AndrewG. Come on, deliver your killer blow that will discredit thousands of papers by hundreds of scientists. Note, ten such articles are listed at Marohasey’s blog, so they’ll make a good starting point for your refutation. posted 8 September 2008 at 1:51 AM by Bernard J.
It’s now 12 September, and no evidence from you yet to support your claim that increasing atmospheric CO2 would magically ‘enhance the biosphere and environment’. There are many species that would beg to differ, and who are waiting to have their concerns assuaged. posted 12 September 2008 at 8:02 PM by Bernard J.
posted 19 September 2008 at 10:24 PM by Bernard J. Climate Change Q and A Seminar 3: Friday 5 Sept – what future climate change scenarios are possible?